DEMs were the first widespread mechanisms for distributing and displaying digital topography. Point clouds are collections of 3D points located randomly in space. A sensor emits a pulse of energy and times its return trip (TWTT, two way travel time). Knowing the position of the sensor, and the direction in which the pulse was transmitted, the 3D location of the reflecting surface can be determined. The sensor can also measure the intensity of the return, to estimate the surface geometry and material composition of the reflecting surface. 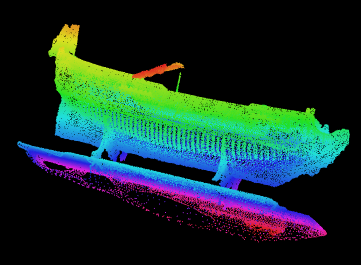 The point cloud can be used directly, or converted to a 2.5D grid, a DTM or DSM. As a grid it can be smaller in size, more familiar, and easier to manipulate, than as the point cloud. Lidar is now generally spelled using all lower case letters, and stands for "light detection and ranging". Airborne lidars (laser), fly on a helicopter or small plane, and now on drones. These show the ground, vegetation, buildings, and power lines, and even unwanted objects like birds. This shows a 3D depiction of the point cloud. 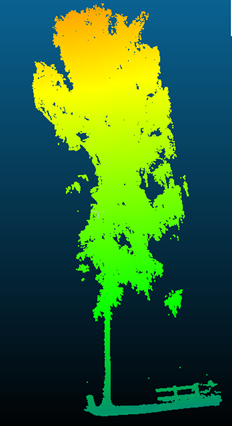 With computer graphics, the point can be rotated about three axes, zoomed in and out. 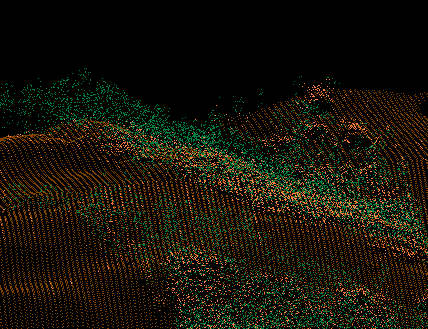 Terrestrial lidar, from a scanner set on a tripod. This can done outdoors or in a lab or museum. New technology is expanding lidars to work underwater, despite the much greater attenuation of light compared to sound. This slice in the XY plane shows the locations of the sensor, at the center of each of bull's eyes, on the deck of a ship in a museum, because the scanner is limited in how low it scans and it does not directly below the tripod. Mobile lidar can be mounted on a backpack, or on a vehicle (car or train) for mapping corridors or a drone, with a very large point density and relatively rapid data collection. Scanning Sonar, from a ship or ROV. For really high resolution results this will be from an ROV which will slowly survey the object. The sonar can also be placed on a tripod on the bottom, and then moved a few times for complete coverage. Sound travels at about 1500 m/s, a small fraction of the speed of light. This shows a slice through the point cloud. Photogrammetry. We can now create point clouds using a series of photographs, finding matching points, and deriving the point cloud from that. This is from photographs of a ship model in a museum. Traditional photogrammery used high precision cameras and equipment to manipulate the photographs, and required skilled operators. Structure from motion (SfM) is a range imaging technique; it refers to the process of estimating three-dimensional structures from two-dimensional image sequences which may be coupled with local motion signals. SfM can use consumer grade cameras and computing power to rapidly and nearly automatically create point clouds. Photography will not penetrate foliage, so the resulting surface will be a DSM. It is much cheaper to put a good camera on a drone, compared to a lidar sensor, so this offers a lot of potential if you can live with the DSM and no ground points, or acquire the ground points some other way. You can also view 2D slices through the point cloud. While not as visually exciting as the 3D rotating displays, slices allow measurement and may more clearly reveal relationships.